Kyai Ageng Pemanahan degree Kyai Ageng Mataram. 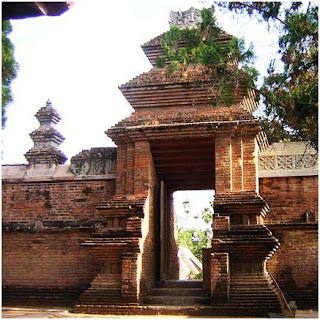 Mataram is the name of the area awarded to him by the Sultan Hadiwijoyo Sultan, Sultan of the Kingdom of Pajang. Because Kyai Ageng Mataram with his son Loring Hangabehi Market (Danang Sutowijoyo) has been able to beat Duke Raden Aryo Penangsang in 1527 AD in Jipang Panolan. Kyai Ageng Pemanahan next to the Sultan asked permission to occupy the area of ​​Mataram. Sultan Hadiwijoyo allowed and advised, "A girl from Kalinyamat nurtured and guarded it so well. Moreover, an adult should be brought into the Palace ". The message was affordable by Kyai Ageng Pemanahan, but he begged to be allowed to take the son of Sultan Hangabehi Loring Market to move to Mataram. Kyai Ageng Pemanahan tlatah family went to Mataram with two people in-law, ie, Raden Dadap Write and Tumenggung Mayang. Plus Nis wife Nyi Ageng Kyai Ageng Mataram and advisors Ki Ageng Martani Savior. This incident occurred on Thursday the 3rd of Pon Jimawal Rabiulawal years. Stopover on their way to the Palace Pengging pilgrimage day and night. Kyai Ageng family prayer and prayer, asking directions to the Lord, doing meditation and prayer intention, his prayer was accepted of God, a sign of the trees appear instantly become skewed, but the tree fibers remain upright. After the morning prayer they went to Mataram and stopped at the village Wiyoro. The next village to build a village that is temporarily stopped Karangsari after Kyai Ageng Pemanahan and Saviour Ki Mertani looking banyan tree has been planted by Sunan Kali Jogo for tetenger in Mataram region is located there. Lies the tree on the southwest Wiyoro. Then select the land south banyan would be used as a yard and house to reside Kyai Ageng Pemanahan and their families. They worked hard, until he completed the construction of houses within a short time. Then a new home soon occupied Kyai Ageng Pemanahan which then famous name with a degree Kyai Ageng Mataram. 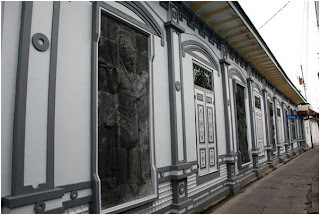 Many foreign relatives thus adding to the Mataram Mataram bustling and prosperous (now known as Kotagede, silver handicraft center in Yogyakarta). Ki Ageng Mataram; my son .. why do you dare disturb her seclusion, it would anger later when Sinuhun know. Sutowijoyo Raden said: "I dare do it, because it has received a revelation. KAM: How can you say so? R.S: Yes. So when he heard the roofs fallen father Sultan was surprised, anyway, when about to drink coconut water was surprised too. Kyai Ageng Mataram states, has yet to take his time and his son is hoping to remain faithful promise. Both depart, go to the Sultanate Pajang. Sinuhun Sultan mingle Hadiwijoyo being confronted his son and his family. Seeing the arrival of his son escorted Kyai Ageng Mataram. Then, after shaking hands Ngabehi Market Loring was facing deliver to worship-service. Sinuhun asked in astonishment why is not the time came to face. Kyai Ageng Mataram states that faced him was because his son has sinned greatly dared to violate and disturb her seclusion from Kalinyamat. Sultan wisely Sinuhun Hadiwijoyo said, "Son without sin, in that case it was my fault, not thinking about children who have grown up. Therefore we also already agreed to participate. But children do not dimurka, pleaded Sinuhun to Ki Ageng Mataram. "Brother Jurumartani, instead of the occupants of Mataram is Ngabehi Loring Market and hope are agreed upon with the name of Prince Haryo Mataram Senopati Canto". Ki Jurumartani agreed then ask permission again, this event occurred in 1540. Then Prince Haryo Mataram was appointed in 1551 titled Dal Kanjeng Panembahan Senopati ing Ngalogo who controls the land of Java. Then down the kings of Surakarta and Yogyakarta, as well as the Regents on the coasts of Java until now. Kanjeng Panembahan Senopati royal power 13 years old. After gering later died, on Friday Pon month of Suro Wawu year 1563. Buried in the west of the mosque under his father. The next son who succeeded to the title of His Majesty King Kanjeng Hanyokrowati. His coronation in the same month with the death of Kanjeng Panembahan Senopati. One day, His Majesty Kanjeng go into the woods hunting deer. With nothing seemed to have split with the introduction and his bodyguard, his back then he was attacked by a deer and he fell to the ground. Sinuhun appointed to the court and he was ordered to call kakanda Panembahan Purboyo. Sinuhun said, "Kakanda, if we were to die, because Gusti Hadipati're traveling, your son please Martopuro State designated as deputy master of Mataram. Mandate is affordable, well-known with a degree Sinuhun Sinuhun Krapyak Seda. He died in the Great, god Jimawal 1565 and was buried at the bottom eating his father, Panembahan Senopati. 1. Sinuhun UB V, last king of Majapahit kingdom berputera Raden Bondan Kejawan who holds Kyai Ageng Tarub to III. 2. Kyai Ageng Tarub III had sons called Kyai Ageng Getas Pandowo. 3. Kyai Ageng Getas Pandowo berputera Ki Ageng Selo. 4. Kyai Ageng Selo berputera Ki Ageng Nis. 5. Ki Ki Ageng Nis berputera Ageng Pemanahan (Ki Ageng Mataram). 6. Ki Ageng Pemanahan berputera Kanjeng Panembahan Ngalogo Senopati ing. 7. Kanjeng Panembahan Senopati ing Ngalogo berputera Sinuhun Hanyokrowati King. For most people, especially Java, Yogyakarta and Solo, believe in the mystical story of the kings of Mataram which is closely linked to Kanjeng Queen of South. Queen of South Kanjeng entity is in fact not a kind of genie, demon or devil, but it is a manifestation panitisan of the angel, who descends into the earth his magical dimension (not nature spirits / barzah), plays a role maintaining the balance of the universe, especially along the southern coast of Java and the southern archipelago Samodra . Nature preserve by preventing or punishing people who do not respect the universe created by God Almighty, or people who destroy the natural balance by taking the natural wealth of the greedy and avaricious. Queen of South Kanjeng as king or queen gung binatara mandraguna wise and powerful, is subject to Gusti Ingkang manembah Akaryo universe. However, Queen of South Kanjeng spirits remain as separate entities, in the sense of not having a body or bodies in physical form. 1) Although Queen of South Kanjeng can master Samodra, whatever his will undone. But still lost prestige with Gusti Kanjeng Panembahan Senopati. 2) Queen of South Kanjeng usually crave friendship between the royal kingdom of spirits Senopaten. Further requested that once the tempo Gusti Kanjeng Panembahan Senopati willing held a meeting in the world of spirits. Even with great difficulty until Panembahan Senopati undertakes hereditary. CRA: "... Let Kangmas Priyagung agigit, along with us, just leave the Empress and the man's daughter cemetery. You are in nature we will get a more satisfying change. Change of Mataram, I will accept gladly. In the kingdom of our lord be with dignity, we worship and we are ready to serve until the end of time. GPS: "... Because it is so in love with my Dinda, I was not going to waste, I welcome the love of friendship helping Dinda. But our fathers told, the human race is because it comes from the earth until the end of his life should also be buried in the earth. Inappropriate and is changing the type of abstinence we become spirits. Therefore do not worry about my broken promise, every day is always pictured facial beauty Adina. In due time we met just once ". Similarly glimpse history Mataram beam, which can reveal more or less true magical relationship Mataram kingdom were hereditary kingdoms of the world with subtle in the southern ocean. How to put a proper and wise among men with spirits who are also creations of God Almighty Gusti Wisesa. Can be an example for the present generation to understand how human relationships with supernatural beings. Human should be able to be thoughtful and not arrogant, they put the supernatural as a human interaction with mutual respect and respect as fellow creatures of God. Because it is still a creature of God, spirits still have a character like humans, some are good some bad, some are manembah to God, but some are defiant. 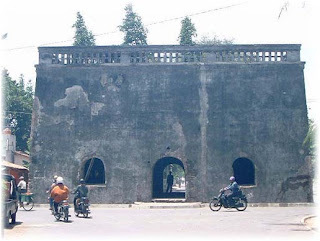 Description compiled from interviews Jurukunci Pasarean (tomb) Agung of Mataram in the town and in Imogiri Bantul and the court employees, as narrated in these two Supreme Pasarean. Reference; Mantri Jurukunci R.Ng. Martohastono.